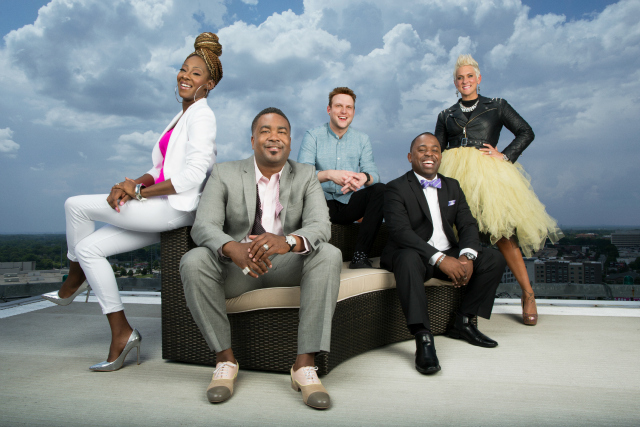 Oxygen Media adds a new show to its Preachers of… reality TV franchise. Preachers of Atlanta premieres Wednesday, February 3 at 10:00pm ET/PT. The series focuses on five different pastors and their unique ministries, and touches on some of today’s controversial issues. The cast of Preachers of Atlanta features: Pastor Corey Hambrick, Pastor Le’Andria Johnson, Pastor Canton Jones, Pastor Kimberly Jones-Pothier, and Pastor Judah Swilley. Preachers of Atlanta is produced by L. Plummer Media in association with Relevé Entertainment. Lemuel Plummer, Holly Carter, Chris Costine, and Mark Scheibal executive produce. An Atlanta native, Pastor Corey Hambrick is the pastor of the Life Church Christian Center. Recently celebrating its fourth year of ministry, the Life Church Christian Center has become one of the most buzzed-about churches in the Conyers community. First hearing the call of God at the early age of 14, Pastor Corey believes in the importance of building up the church and also the community. Living by his conviction to not only save souls but to also save lives, Pastor Corey divides his time between his ministry and being a Sergeant Detective at the City of Conyers Police Department. Between spending quality time with his wife, Corrinne, and their beautiful daughters, Chloe and Mariah, uplifting his congregation, and defending the shield he wears with honor against those who question its merit, Pastor Corey remains committed to his work as both a pastor and a police officer. A Grammy(R) Award-winning recording artist, Le’Andria Johnson currently pastors I.P.C. (Imperfect People Changing) Ministries in Atlanta. Employing what some may consider unorthodox methods in her ministry, she is willing to take extreme measures to reach those in need. In addition to winning a Grammy, Le’Andria is a two-time Stellar Gospel Music Award winner and Billboard magazine’s #1 Female Gospel Albums Artist of 2012. Le’Andria has taken the gospel music scene by storm since being crowned the season three winner of BET’s “Sunday Best” in 2010. The Music World Gospel recording artist’s groundbreaking and chart-topping debut CD, The Awakening of Le’Andria Johnson, entered at #1 on multiple music charts, including both the Billboard Top Gospel Albums and the Top Christian/Gospel Albums charts. The CD also debuted at #1 on the Christian Music Trade Association’s Current Gospel Overall chart. In 2011, Le’Andria received her first Grammy(R) Award for Best Gospel/Contemporary Christian Music performance for her debut single, “Jesus.” In 2012, she received her first NAACP Image Award nomination for Outstanding Gospel Album (Traditional or Contemporary) for her current CD project, Le’Andria Johnson The Experience. Known for her captivating live performances, Le’Andria is expanding her music ministry and breaking new ground all over the world. A Florida native, Pastor Canton Jones found his ministering voice through the power of music and is the pastor of Free Life Church. Currently residing in Atlanta with his wife and business partner, Ramona, and their three sons–Justice, Dominion, and Canaan–and daughter, Love, Canton ministers with determination and transparency, in the hope that this generation will find ways to incorporate God’s word into their own lives. Pastor Canton is the president of Cajo Records and serves as a media triple threat, working as a successful rapper, songwriter, and producer. Pastor Canton has performed in front of millions of people and released countless albums throughout his lucrative career. An award-winning artist, he has been nominated for a Grammy and a Stellar Award, and he has won three Gospel Choice Awards. With a jam-packed schedule, Pastor Canton is faced with juggling his musical career, serving his congregation, and continuing to expand his musical ventures, all while preparing to welcome a new bundle of joy into the family. Pastor Kimberly Jones-Pothier is a life coach and mentor with the desire to lead others to their purpose by realizing their passion. The daughter of two preacher parents, Pastor Kimberly and her husband, Mark Pothier, are Senior Pastors of Church of the Harvest in Fayetteville, Georgia, where they reside with their two sons, Morgan and Lyncoln. Pastor Kimberly leads a movement called Conquering Hell in High Heels and travels the world preaching, teaching, and leading others as she “loves people back to life.” A well-known evangelist, she balances running a thriving church and staying up-to-date with both her congregation and her social media followers. Her toughest challenge yet may be upon her as she prepares to meet her husband’s sons from a previous relationship for the first time while working to spark her own sons’ interest in the ministry. Judah Swilley grew up in the ministry and is a fifth-generation preacher. He recently launched a new church called The Movement, where he pastors full-time at weekly worship services, hoping to inspire youth to come back to the church. Judah feels that people, particularly youth, are hungry for God, but are done with the “division of religion.” His goal is to bring people from all walks of life together in a mission to change the world. By presenting God in a loving light and relevant way, he feels that this next generation will fall in love with God the way he did so long ago. Prior to starting The Movement, Judah served as Youth Pastor of Church In The Now for six years and grew the ministry to one of the largest youth outreaches in the Atlanta area. Judah travels to churches, conferences, and schools across the country to share his story and spread the love of Christ in a real and radical way. In addition to ministry, music has been one of Judah’s premiere passions since he was just five years old. At 12, he released his first album and has since released many records that have received national attention, with his music being featured on numerous news channels, radio stations, and media outlets. Oxygen Media is a multiplatform entertainment brand that targets young, multicultural women. The network’s relevant and engaging content reflects how real women with real stories see the world – vibrant, optimistic and bold. Oxygen is the destination where women can come together across multiple platforms to have fun and encourage each other through their individual and collective journeys. The growing network’s unscripted original programming includes “Sisterhood of Hip Hop,” “Pretty. Strong.”, “The Prancing Elites Project,” “Like A Boss,” “Create Your Day Job” and the popular “Preachers” franchise. Available in over 77 million homes, Oxygen is a program service of NBCUniversal Cable Entertainment, a division of NBCUniversal, one of the world’s leading media and entertainment companies in the development, production, and marketing of entertainment, news, and information to a global audience. Watch Oxygen anywhere: On Demand, online or across mobile and connected TVs. Watch a sneak peek at Oxygen Media. What do you think? Have you watched the Preachers of L.A. and/or Preachers of Detroit TV series? Do you plan to check out Preachers of Atlanta? If BLM, then please break the yoke of the slaveowners’ religion and see the end of the problems.